RwandAir sits in the backyard of two of Africa's three airline powerhouses (Ethiopian Airlines and Kenya Airways). It has been quietly constructing a regional Africa network with the aim of establishing its home at Kigali as a hub for the continent; 40% of the airline's traffic connects. Its hub aims were significantly heightened with ambitious if risky plans to launch long haul 787 services in 2017. But growing competition has caused the airline to believe it must establish a long haul network earlier if it is to carve a stake in the future. Long haul flights to China and India are being accelerated with an anticipated 2016 launch using A330s instead of 787s. RwandAir will take a single A330-200 and A330-300 to provide balance between providing range and volume. Guangzhou and Mumbai are contenders, and are hoped to be served with local pick-up rights from Dubai, currently RwandAir's only destination outside of Africa. RwandaAir's small non-African destination count will have disproportionately larger size – and risk – in ASK and revenue terms. Regional Africa remains the carrier's heart. An additional 737-800 is planned for each of 2016 and 2017, giving the airline 12 aircraft by the end of 2017 and doubling its available seat capacity. The plan is to ultimately use the new widebody fleet to serve Mumbai non stop from Kigali. But Mumbai could initially be launched in 2015 or 2016 using 737-800s if RwandAir is successful at securing fifth freedom rights to serve Mumbai via Dar es Salaam in Tanzania. RwandAir has been looking at 787s since 2011, when it reportedly signed up for two 787 options from Boeing during a visit to pick up its first 737-800. Boeing has not yet booked a 787 order from RwandAir and it is unclear if these options can still be exercised. But RwandAir could instead potentially look to source its planned acquisition of two 787s from leasing companies. RwandAir is accelerating long haul operations. Deputy CEO and COO Jean-Paul Nyirubutama said at the MENA Aviation Festival that growing competition means RwandAir must enter long haul flying earlier if it is to carve a role later. If RwandAir entered on a more financially ideal timeframe, when its regional network was bigger (and thereby supply necessary feed), it would be harder to establish a presence. "When you don't grow, you get swallowed," Mr Nyirubutama says. Low fuel prices provide a much needed cushion to reduce costs. The airline's long haul vehicle was switched from 787s (which Mr Nyirubutama says the carrier no longer has available to it) to A330s. RwandAir in Mar-2015 signed an MoU with Airbus for an A330-200 and A330-200 powered by Rolls-Royce Trent 700 powerplants. A firm contract was signed in Sep-2015, just over a year before delivery. RwandAir signed an agreement with the Eastern and Southern African Trade and Development Bank (PTA Bank) for a 10 year USD160 million loan to finance one A330-200 and one A330-300 for delivery in 2016. The A330s will arrive direct from Airbus in Sep-2016 and Nov-2016. The aircraft will have business class, premium economy and economy seating. The A330-200 will have 245 seats and the A330-300 262 seats, according to Mr Nyirubutama. This is a slight downward revision from the configuration stated when the contract was signed in Sep-2015 (A330-200 having 20 business class, 21 premium economy and 203 economy seats and the A330-300 having 30 business class, 21 premium economy and 223 economy seats). There is limited scale with only a small number of aircraft. The two A330 variants RwandAir will take have much commonality. The carrier believes it is worthwhile to have different types in order to accommodate markets that need the A330-200's range (and possibly lower capacity) and larger markets that are relatively closer and can be served with the A330-300. It is planned the widebody fleet will one day grow to provide scale, but there are no firm plans. The A330s will initially fly to Dubai, China and India, as well as possibly some African destinations. RwandAir has been looking to grow its Dubai capacity and preferred to expand through up-gauging rather than frequency. The carriers offer four weekly non-stop flights and three via Mombasa in Kenya. Its Dubai traffic consists mostly of African traders conducting business in Dubai. It expects its Chinese traffic to be very similar. Exact points and frequency (less than daily) are still being considered. But the front runners – subject to change – are China's Guangzhou and India's Mumbai. Guangzhou has China's largest African community, who are in the southern Chinese city to acquire goods and bring them back to Africa. Most are (comparative) small volume traders although they travel with considerable excess baggage. This ensures the goods arrive (many have experienced shrinkage when transported through other means) and avoid sticky-fingered port officials. Both Ethiopian Airlines and Kenya Airways serve Guangzhou (as does Emirates, a large player in the Africa-China market, and also Air Madagascar) while other carriers access the region through Hong Kong, which with Guangzhou are part of the Pearl River Delta. Ethiopian has expanded more aggressively in China than Kenya Airways, but Guangzhou remains an important part of its network. RwandAir expects to be able to utilise local pick up rights between Dubai and its Chinese and Indian points. There is local demand between Dubai and India and Dubai and China. But RwandAir will have less than daily service (to Mumbai, Emirates has five daily flights while Air India, IndiGo and Jet Airways serve the route) and is a relatively unknown player, potentially making it difficult to have strong fifth freedom traffic. At around six hours from Kigali, Mumbai is well within the A330's range and could be served non-stop. If the concern is filling the A330 with Africa-India traffic, then India could be accessed via Dubai on a 737, although this may be counter to RwandAir's objective to grow Dubai. Ethiopian and Kenya Airways have some services from their hubs to India on non-stop 737 flights. However, a Kigali-Mumbai non-stop service would be about 400 miles longer than Nairobi-Mumbai (and 900 miles longer than Addis Ababa-Mumbai). Stronger point-to-point traffic to India compared to China should make a non-stop service more viable. Africa-India traffic is growing quickly, albeit from a low base. Africa is India’s fastest growing trading region and India is actively cultivating the relationship to counterbalance China’s influence. Previous reports also flagged Malaysia as an initial long haul destination, with Germany and UK points to later follow in 2017 and 2018. But RwandAir is distancing itself from these reports and any timetable. For Africa-China/India through traffic, RwandAir will face strong competition. Although approximately 40% of its traffic is transfer, it expects transfer traffic on a China route will be 50% or more. That means most traffic (travelling beyond Kigali) will face a two stop proposition in Kigali and Dubai. However, a price sensitive market will accept this. Some of Ethiopian and Kenya's flights to Asia make stops en route, and Gulf carriers mostly have one stop offerings. There is growing foreign traffic in Kigali as well as its source markets. 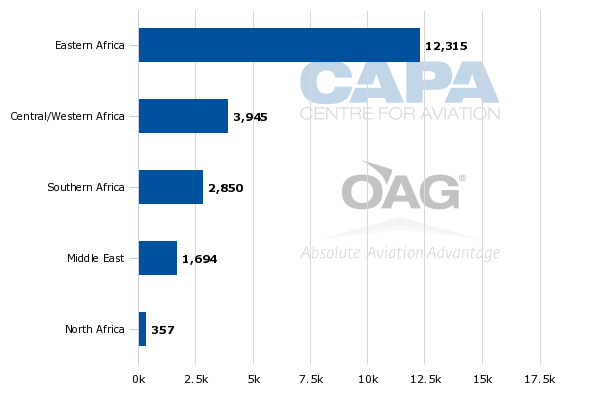 Home peers Ethiopian Airlines and Kenya Airways are giants – in Asia and Africa – that RwandAir will be up against with a smaller network in Africa and outside, as well as lower recognition given its short history. Gulf carriers will also be competitors. Chinese airlines are increasingly flying to Africa under direction from their government. Air China's Addis Ababa service will rely on feed from fellow Star airline Ethiopian while its Johannesburg service will also need feed from around the region. Both of these services however are to Beijing, a very different market from RwandAir's possible destination of Guangzhou. Flying on Air China from Africa to Guangzhou via Beijing would require over six hours of backtracking in the air plus ground time at Beijing. More of a competitive concern is China Southern's three weekly service from Guangzhou to Nairobi, near Kigali. China Southern will access beyond Nairobi feed via SkyTeam partner Kenya Airways. Aside from regional aircraft, RwandaAir was lining up to be a mostly Boeing operator. The introduction of A330s allows for a faster long haul launch and perhaps more economical solution as the 787's performance is best felt on longer routes, which will be limited for RwandAir. Taking A330s also gives RwandAir leverage between Airbus and Boeing. Boeing has been a strong partner of RwandAir, hoping to ensure the carrier's success but also a close relationship between the two, as exists with Kenya Airways and largely with Ethiopian Airlines (Ethiopian has A350s on order). (South African Airways is mostly an Airbus operator, although it uses 737s regionally, as does its LCC Mango.) RwandAir will continue to take 737s. This includes one -800 in each of 2016 and 2017, both taken up on lease. With a relatively small number of narrowbody aircraft, more ambitious narrowbody expansion – or fleet re-generation – could tip to Airbus, now that the A330s give closer tiers between the two carriers. Boeing may work harder to keep its narrowbody presence now that Airbus will be supplying widebody aircraft. RwandAir's fleet in Oct-2015 consists of eight aircraft, four of them 737s (two -700s and two -800s) as well as two CRJ900s and two Dash 8s. The additional two 737s and two A330s will increase its fleet by 50% to 12 at the end of 2017. However, as the 737s and especially A330s are larger than the carrier's current average seats per aircraft, Mr Nyirubutama expects RwandAir's available seat capacity to double by the end of 2017. Orders include those placed directly by the operator and by lessors assigned to the operator, from 26-Oct-2015 onwards. 96% of RwandAir's available seats and 99% of ASKs are to international markets. Eastern Africa accounts for nearly 60% of its available international seats. In the medium term, RwandAir says it is considering service to Khartoum and Abidjan, but mostly looking for growth in southern Africa, including Harare, Lilongwe and Luanda. Its existing southern Africa network includes only Johannesburg and Lusaka. Most of RwandAir's international routes are served less than daily. Five have more than daily service while 13 are offered less than daily. 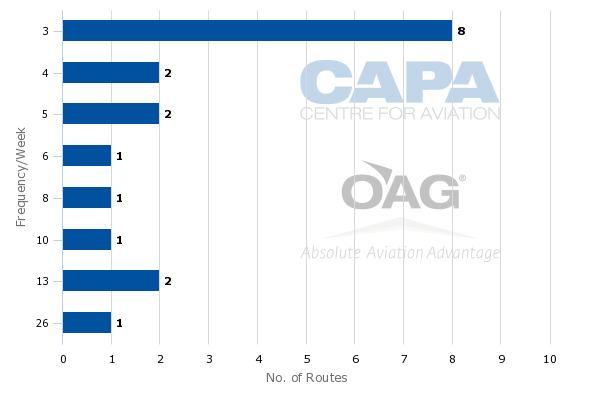 About half of its routes are flown three times weekly. In Aug-2015 RwandAir CEO John Mirenge said the airline was in talks to offer a 49% stake to Ethiopian Airlines or Etihad Airways with the successful partner providing management and technical services for RwandAir. A few days later Etihad said it declined the investment opportunity. Mr Nyirubutama says the talks with Etihad were requested at a government to government level. While an investment did not eventuate, the two airlines are exploring other cooperation channels, such as interline and codeshare. RwandAir's partnerships with Brussels Airlines, South African Airways and Turkish Airlines continue, and it is looking to expand those and form partnerships with other new carriers. RwandAir is entirely owned by the Rwandan government. Mr Nyirubutama says the carrier remains committed to its original plan of introducing a strategic investment around the time the carrier is eight to 10 years old; it is now six years old. RwandAir's cautious regional expansion contrasts with its very bold long haul, widebody expansion. RwandAir will have six 737s and four regional jets/turboprops feeding two A330s in what is already a fragmented and price sensitive market. RwandAir's expansion in 2017 with 787s was already high risk. Although low fuel costs – guaranteed for today and the short term only – provides some help, the proposition remains risky. It is an exceptional and very long term bet on transforming Kigali into a new hub for Africa. There are many reasons to support the ambition. After a traumatic history, Rwanda has emerged to be one of Africa's relatively safe and corruption-free countries. It is, however, small, requiring it to be a hub if it is to support significant air services. There is now a well trodden path of small economies taking on disproportionate size by becoming a hub. The short term opportunities remain within Africa. This is a huge continent but liberalisation has been incoherent, impacting route development. Rwanda has taken a refreshingly liberal approach (both for Africa and globally) in securing liberal agreements, including allowing fifth freedom services. Fifth freedom rights granted to Dubai-based carriers (being used by flydubai) will be reciprocated should RwandAir follow through with long haul services via Dubai. But there is a theoretical risk the country feels it is giving away more than it receives, although this could benefit RwandAir. The Rwandan government must be prepared to stomach the costs of long haul services and operating them may diminish foreign carrier appetite in taking a strategic stake in the carrier. RwandAir still expects that despite earlier long haul service it will break even in 2018. Most African airlines, however, have encountered severe difficulties – and even collapsed – when attracted to establishing long haul routes. But if the Rwandan government is committed to a long term aviation hub in Kigali, it will be willing to sustain the losses of these initial long haul routes – and others to follow if the hub is to blossom.